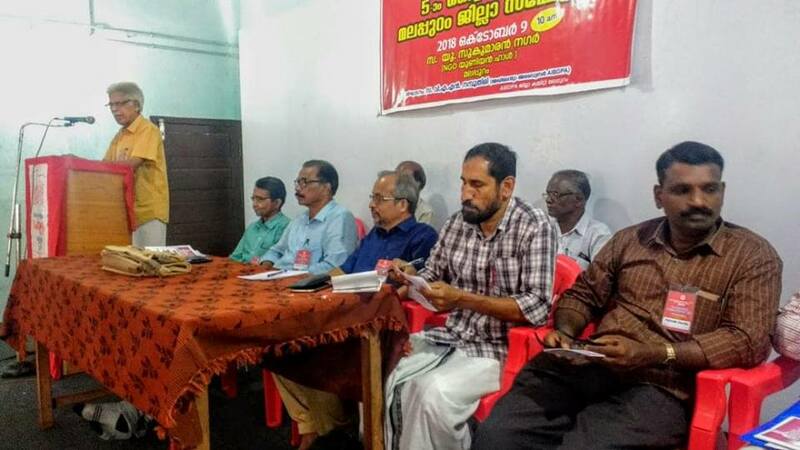 Com.V.A.N.namboodiri, Advisor inaugurated the 5th biennial district conference of Malappuram on 09-10-2018. He explained the issues of the pensioners , especially, pension revision, medical issues and the anti-people policy of the Modi government and appealed to participate in all the agitations, called by AIBDPA<AUAB,Confederation and central Trade unions. Com.P.T.M.A.jaleel, District President controlled the proceedings. Com.M.N.Madhavan welcomed the gathering. Coms.N.Guruprasad, Circle Secretary, V.P.Abdulla, District Secretary, BSNLEU, Kamalraj (SNEA) , P.T.Kunhippayi, ACS and P.Kesavadas, District Secretary, CCLU addressed the conference. The subject session held in the afternoon was inaugurated by Com.N.Guruprasad, Circle Secretary. The biennial report and audited accounts presented by the District Secretary and Treasurer were adopted after discussion.